please write to me if you have any information to add. I can not guarentee that these are every company or every builder from the Lake Erie region. The National Dining Car Co. never had its incorporation mentioned (unless it was during one of the weeks the newspapers were not available on microfilm). I only heard about Guy E. Russell from a relative and Peter Schneider because they had a blurb about him building a dining car. The Modern Dining Car Co. story was related by Jim Pickup. So I think I can safely say that I don't know about every builder. Check out the list of diners past and present from these companies. Also listed are dining cars mentioned in newspapers whose builder is not known. This list is a work in progress. If you are able to add to this list, the contact information is at the bottom of this page. For a list of just about all the diner manufacturers in the country, click here. Do you have a comment to make about a diner or a diner builder? Closson - Check out the Closson Lunch Wagon Co. webpage. Rich Dining Car Company - Started by Earl B. Richardson who was from Westfield, NY. In 1908 he came to Silver Creek during Old Home Week with a home made lunch wagon. He supposedly never left. He eventually started up the company in 1921, which moved to Dayton, Ohio around July 15, 1926. This move came about a year after his death, and was precipitated by his son, Raymond, who had become the president of the newly incorporated company. His wife, was from Dayton. Liberty - This company was located in Clarence, NY and owned by C.A. Ward. The minimum amount of years they were open are 1928 to 1931. C.A. Ward was in the hospital at the end of 1927 and he had already sold his share of the company to Mr. Lee Dickinson. The company had offices in Buffalo where at least two of their diners were located. Sorge - This company, located in Silver Creek built only 3 or 5 diners. Charles Sorge officially registered the business on Septmeber 13, 1947. They also offered their services at remodeling existing diners. The only surviving example is in Mayville, NY. One or two were possibly sent to Oil City, PA and the other probably to Ashtabula, Oh. A matchbook for a diner in Ashtabula is looks very similar to Sorge's design. One also could have been sent to Painesville, Oh. Sorge also remodeled the former Kendall Diner when it was moved to Fredonia. Silver Creek Dining Car Co. / National Dining Car Co. - Located in Silver Creek. This company was started by Dr. L. D. Fitzpatrick in June of 1923 and it is believed that Dr. Sharpe joined this company. Dr. John J. Sharp et. al. formed the National Dining Car Co. on August 22, 1924. On July 27, 1925, Dr. Sharp was the sole owner of the company. It is known that by June of 1925 that they made 6 diners and one was sent to Woodlawn, NY which is a suburb of Buffalo. A couple of years later, a diner was bought of Dr. Sharpe and installed in Silver Creek. This diner had a barrell roof, unlike most or all of the previous diners built in Silver Creek. Some Articles can be read here. Rochester Grills - One of three area companies that made other products and decided to branch out into diners. (The other two being Mulholland and Bixler). Four Rochester Grills are known to be standing, all in varied shapes of originality. They started out around 1936, and lasted until about 1940. They hired away the plant manager from the Bixler Co. when they closed shop. Modern Dining Car Co. - Possibly out of Dunkirk. Estes Pickup Sr. was an investor. The company went belly up in 1929, leaving Mr. Pickup with 3 diners: Batavia, East Aurora and Brooklyn. Bixler - Manufactured first in Fremont, Ohio around 1929, then in Norwalk, Ohio after a fire at their Fremont plant. They lasted until around 1935. Monitor Car Co., - Rumored also to be lunch wagon manufacturers. 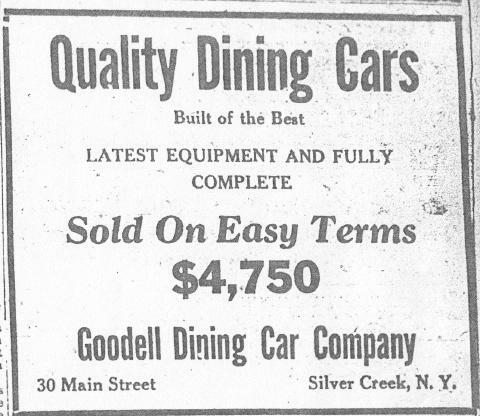 Goodell Dining Car Co. - Just one advertisement that mentions that for $4,750 you could get "Quality Dining Cars. ", Built of the Best", "Latest Equipmet and Full Complete" dining car. It was "Sold on Easy Terms" and the company had its offices at 30 Main St. it was said that the company built 4 diners a year, for a few years. Guy E. Russell - Was located in Ripley, NY and built at least one diner in his yard. In the 1930 census, his occupation was listed as a lunch car maker. The diner went to nearby North East, PA in 1930. Peter Schneider - Built at least one dining car in Gowanda in 1922. Peter was a resident of Silver Creek in 1921. He moved to Gowanda late in 1922. His building of a dining car in Gowanda did not make the Gowanda newspaper. His car was probably replaced by a Liberty, Nelson's Diner, as it was owned by his son-in-law. Dag-wood Diner Inc. - This company was located in Toledo, Ohio. They made the kit that became the Fleetwood Diner in Ann Arbor, MI in 1949. They also made a diner that went to Erie, MI that has now been remodeled beyond recognition. The company was listed in the 1948 city directory, but not the 1945 or the 1950. Albert C. DeCatur was the president, and also ran Active Business Brokers, a real estate firm. George H. Burrows, of Cleveland, was the vice-president, Jason A. Coughlin was the secretary. He also ran James A. Coughlin Inc., "Creators & designers of bar fixtures of distinction, a complete service, bars, back racks, ...". Clarence E. Ghent was the treasurer. They shared an office with Active Business Brokers in the Security Building at 245 Huron St, room 313. One former owner of a Dag-Wood diner mentioned that no more than half a dozen were made, though this has not been verified. J.G. Kuhlman - A subsidiary of Brill. Brill built boxy diners at their Wason plant in Springfield, MA, a plant in St. Louis, MO and at this plant in Cleveland. The diners were mostly made of metal. Their target area was the upper midwest. Ellis Omnibus and Cab Co. - A company that built some lunch wagons in Cortland, NY in 1896. A photo exists from a magazine called "Carriage Monthly". Guedelhoefer Wagon Co. - Located at 307 Kentucky Ave. in Indianapolis, they offered a lunch car for sale in the classifieds section in 1910. Diner Dinette - The Spillman Engineering Corporation of North Tonawanda diverged from building carousels and simple traveling rides, and started building a diner known as the Diner Dinette. They advertised in the New York Times around 1940. Site maintained by Michael Engle.